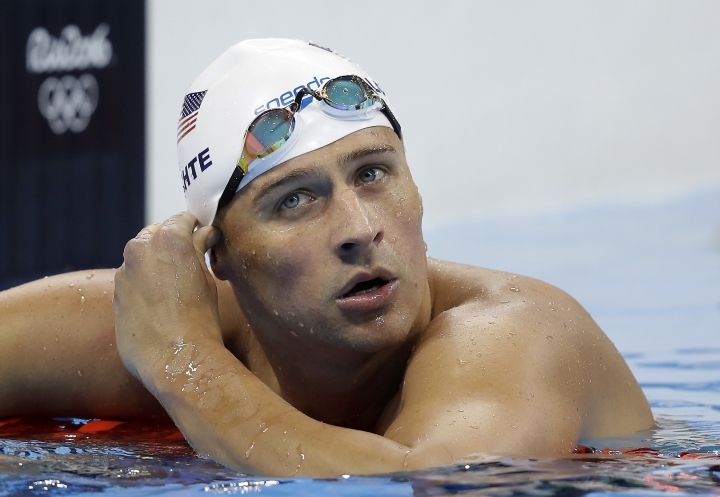 RIO DE JANEIRO — Ryan Lochte and three other American swimmers were robbed at gunpoint early Sunday by thieves posing as police officers who stopped their taxi and took their money and belongings. In the latest security incident to hit the Rio de Janeiro Games, Lochte told NBC that one of the robbers put a gun to his forehead before taking his wallet. No one was injured. "While it is true that my teammates and I were the victims of a robbery early Sunday morning, what is most important is that we are safe and unharmed," Lochte said in a message posted on Instagram. "I look forward to getting home so that I can begin to map out the plans for my future with an eye on representing #TeamUSA at the #2020 Tokyo Olympics." Lochte and his teammates were returning to the athletes' village by taxi after a night out at the French Olympic team's hospitality house in the Rodrigo de Freitas area in the upscale south zone of the city. The outing was several hours after Olympic swimming ended Saturday night at the Rio Games. "Their taxi was stopped by individuals posing as armed police officers who demanded the athletes' money and other personal belongings," U.S. Olympic Committee spokesman Patrick Sandusky said in a statement. "All four athletes are safe and cooperating with authorities." Sandusky told The Associated Press the robbers took cash and credit cards only, and that no Olympic medals were lost. Traveling with Lochte were Gunnar Bentz, Jack Conger and Jimmy Feigen. Lochte swam in two events at the Rio Games, winning gold in the 4x200-meter freestyle relay. He is a 12-time Olympic medalist. Bentz and Conger were also part of that relay, their only event in Rio. Feigen was on the 4x100-meter freestyle relay, another gold winner for the U.S. in Rio. "We got pulled over, in the taxi, and these guys came out with a badge, a police badge, no lights, no nothing just a police badge and they pulled us over," Lochte told NBC's "Today" show . "They pulled out their guns, they told the other swimmers to get down on the ground — they got down on the ground. I refused, I was like we didn't do anything wrong, so — I'm not getting down on the ground. "We are all safe," Bentz tweeted. "Thank you for your love and support. P.S. the gold medal is safe." Word of the robbery touched off a chain of confusion between Olympic and U.S. officials. An International Olympic Committee spokesman said reports of the robbery were "absolutely not true," then reversed himself, apologized and said he was relying on initial information from the USOC that was wrong. "I couldn't believe it," said Michael Phelps, a good friend of Lochte's and one of his roommates in the athletes village. Phelps spent the evening with his family and wasn't out with his teammates. Brazil's sports minister, Leonardo Picciani, said that the swimmers were "outside their places of competition and outside the appropriate time." He said no athlete had run into problems at the venues or in the athletes village. Street crime was a major concern of Olympic organizers going into the games. Brazil deployed 85,000 soldiers and police to secure the games, twice as many as Britain used during the 2012 London Olympics. Last week, a Brazilian security officer was fatally shot after taking a wrong turn into a dangerous favela, or slum. Two Australian rowing coaches were attacked and robbed by two assailants in Ipanema, and Portugal's education minister was held up at knifepoint on a busy street. In addition, stray bullets have twice landed in the equestrian venue, and two windows were shattered on a bus carrying journalists in an attack that Rio organizers blamed on rocks and others claimed was gunfire. American swimmer Nathan Adrian said he's not concerned about his safety. "Rio is an amazing city," he said. "There's going to be problems anywhere you go. We have been briefed on how to mitigate those risks as well as possible." Now that swimming is over, Adrian added, the athletes want to see the sights and sounds of Rio. "We just came off an amazing performance," he said. "All of us are ready to enjoy that a little bit after a long time working really hard." Phelps hires his own security when he travels outside the United States. "Every time we travel internationally, we always make sure that everything's very secure. No matter where I'm going," he said. "I have a team, personally, that is always looking out for everything." Phelps said he's never had any trouble during numerous trips to Brazil in the lead-up to the games, many of them tied to his sponsorship deals. "I've felt safe every time I came here," he said. "I've never had an issue."